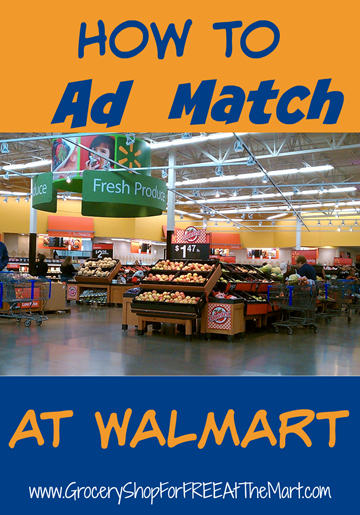 How to Save Money by Price Matching at Walmart! Before we get into the “How” part of this post, let me tell you my story. Back in 2008 when the economy crashed around our ears, I owned a home improvement business that was doing pretty well one day, then evaporated almost overnight. I went from making a comfortable living to struggling to put food on the table. Long story short, my darling wife learned how to coupon and started teaching other people, including me. I quickly realized the power of coupons but then I found out about Walmart’s price matching policy and I was absolutely hooked! I give Walmart a lot of the credit for keeping us afloat during that time and now I am absolutely thrilled whenever I get a chance to teach others how to coupon and price match. In fact, you can watch for our next batch of FREE online couponing classes here or watch this short video series to get the basics. One more thing before we get into the nitty-gritty of price matching. In the summer of 2014, Walmart launched their Savings Catcher program that made price matching a million times easier. All you do is scan the barcode or QR code at the bottom of your receipt into the Savings Catcher section of the Walmart app (or enter the info on the website) and Walmart automatically price matches your receipts against most of the major chains in your area and refunds you the difference. You can see why you should be using Savings Catcher here and see how you can double your refund here. Even with Savings Catcher, there are still several reasons why you would want to price match yourself. Savings Catcher will sometimes miss stuff and it doesn’t price match the smaller “Mom and Pop” type stores in your area. For instance, in my hometown there are several stores that cater to the Spanish-speaking segment of the population. They always have awesome deals on produce but Savings Catcher won’t match them so I have to do it manually. Price matching is a fairly simple procedure, all you do is take a look at the ads that have come out in your area and look for products on sale for cheaper than what Walmart is selling them for. I have a video that will walk you through the process here and I have price match lists I compile every week that will tell you price matching opportunities for most major National retailers. It’s when you actually are standing in front of a cashier, ready to check out that most new couponers begin to falter. It can be a little intimidating to ask a cashier to change the price of something and if that cahier is having a bad day, it’s very tempting to just pay full price and get out of the store. The most important thing about interacting with a cashier is to be confident. If you act like you know what you are doing there will normally not be any problems. Remember the Walmart policy states that you do not have to have the ad, if they have a question about a price, it is their responsibility to have the ad available. (Having said that, I always have the ads saved on my phone, just in case. Anything to move quicker and get me out of there.) I also have a short video describing how to check out here. That’s pretty much it. The most important thing to remember is that it gets easier the more you do it, so try to make price matching a regular part of your grocery shopping routine. Also, if you happen to run in to one of those rude cashiers, here’s a step-by-step method to deal with that. If you have any questions or run in to any obstacles, let me know. I’m always happy to help.